SiO2 is a glass art program designed for young people. SiO2 shatters the conventional notion that glass art is only for adults. 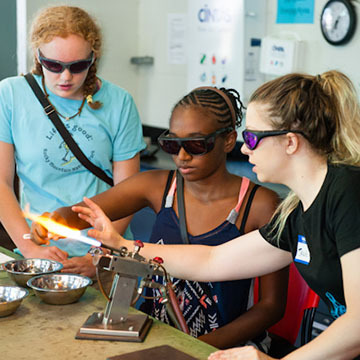 The program’s hands-on courses are structured specifically for young people and are taught in one of the United States’ premier glass facilities. All four of our state-of-the-art studios are open for young adults to explore their creative potential and embark on an education in glass. SiO2 students not only create glass art and learn the scientific principles of glass, they experience valuable life lessons through studio practice. Successful studio glass pieces often cannot be produced by one person alone, so while learning and creating, students are shown the fundamental significance of teamwork, discipline, communication, and mutual respect. Such experiences, in turn, help students understand the nature of leadership and ultimately foster a sense of achievement. 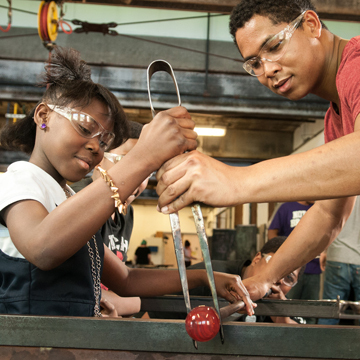 To date, we have taught art glass techniques and effective studio practices to well over 700 middle- and high school students from all over the Greater Pittsburgh region, representing many of the city’s diverse neighborhoods. Many PGC students have received special awards and recognition from their schools in praise of their commitment, creativity, and dedication. Moreover, more than a few have gone on to receive art scholarships from postsecondary institutions, such as Alfred University, Bowling Green, Carnegie Mellon University, Cleveland Institute of Art, Detroit’s College for Creative Studies, Harvard University, Kent State University, Rhode Island School of Design, and Tyler School of Art. 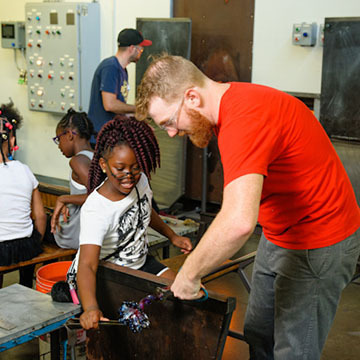 A 1-day workshop for young people to try three different glass making techniques. Spend a Saturday at PGC working with all things hot! At high temperatures, glass can be manipulated in many ways. You’ll learn three different glassmaking techniques: glassblowing at a 2,200 degree furnace, flameworking at the torch, and fusing in the kiln. Grades 6–12. No experience necessary! Students in grades 9–12 work primarily in three of our state-of-the-art studios learning glassblowing, flameworking, and kilnforming. Advanced glassblowing and flameworking courses are also available for students who have completed beginner instruction. Classes meet after school once a week for 10 or 12 weeks. Mixed and Mashed Up is a hands-on, after-school program specifically for students in grades 6–8. Classes meet after school once a week for 12 weeks. 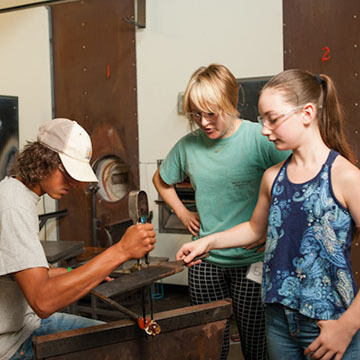 Students spend four weeks in three different studios at PGC learning glassblowing, flameworking, and kilnforming. This intensive program is a great opportunity for anyone in grades 6–12 to learn about glass’ many distinctive characteristics and to gain practical glassworking experience in one studio-concentrated week! 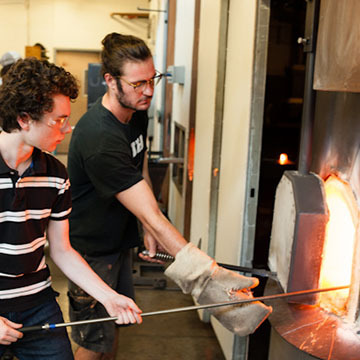 Boot camp sessions include glassblowing, flameworking, kilnforming, and coldworking. Classes are comprised of both morning and afternoon sessions on Monday through Friday during one week in summer. Apply for a scholarship here. 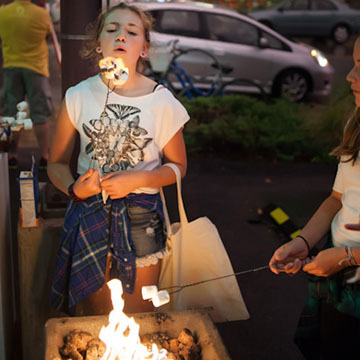 Be a part of PGC’s annual teen art night, open to anyone age 13 to 18. Bring your friends! Have fun, express yourself, try something new, tap into your creativity, and connect with other young creative people. Dance, eat, and add new creative people and organizations to your circle of friends!